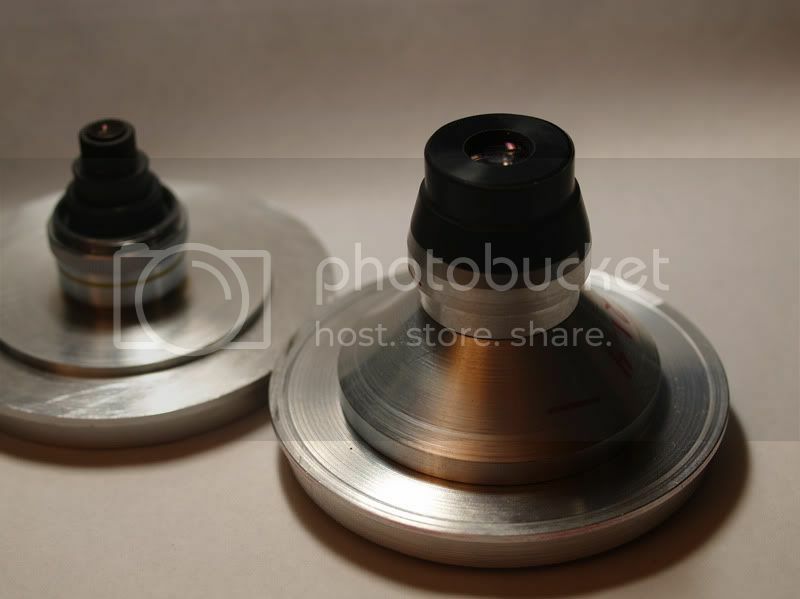 It consists of two el cheapo rings from eBay, a standard Nikon F-mount-to-52mm(male) thread adapter, mated to a 52mm(female)-to-30.5mm(male) step ring. The OD of the JML is about 0.5mm smaller than the through-hole in the step ring. 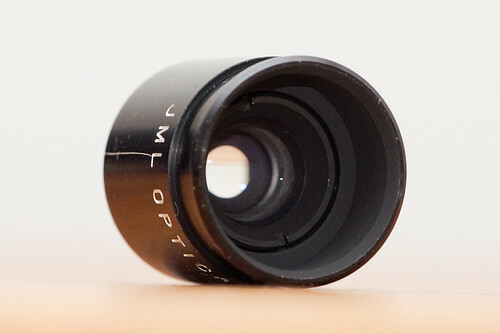 Two layers of gaffers' tape on the JML allows the lens to be press-fit into the ring. 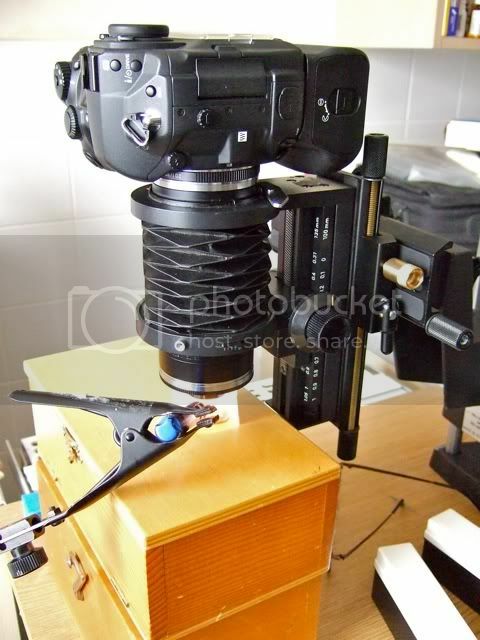 The lens is aligned perpendicular to the mount by leveling the back of the lens with the step ring. 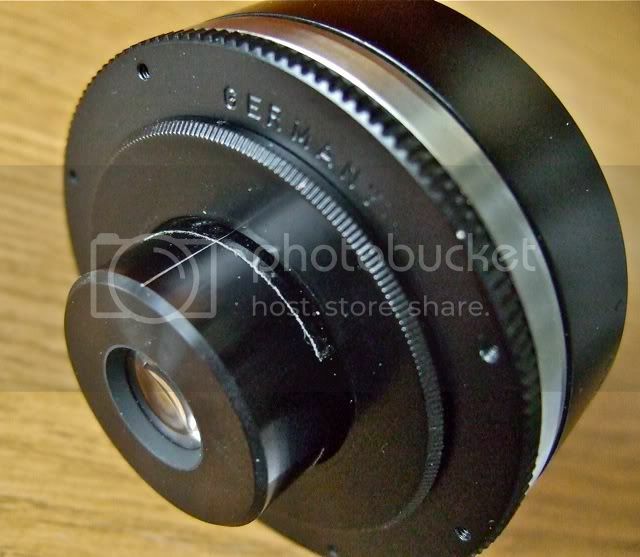 The lens can also be mounted near its front so it will be recessed into the bellows, for lower minimum magnification. This probably won't adapt to other systems, but I've started to make my adaptors fit the 57mm extension tubes. It makes it easy to buy an adaptor for any lens mount and plug it into the system. The JML adaptor has Nikon BD Plan threads on one end and the lens is a loose fit in the other, it's held in the adaptor by black electricians tape. 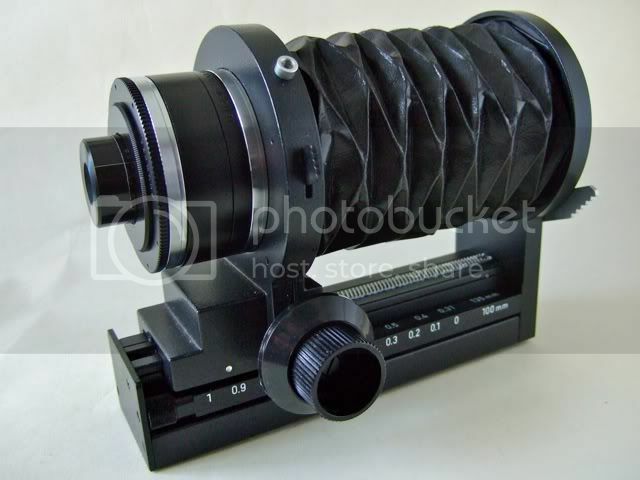 I use the mount from a slaughtered M39 lens (as seen here). 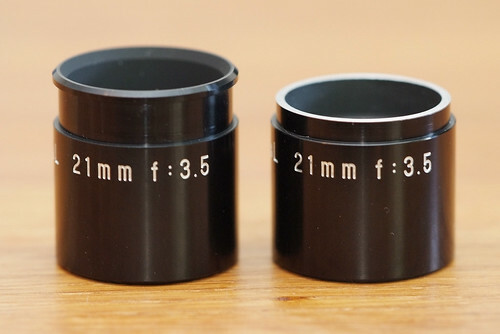 It seems there are several versions (different brands) of this lens so perhaps they are fairly common (see here). 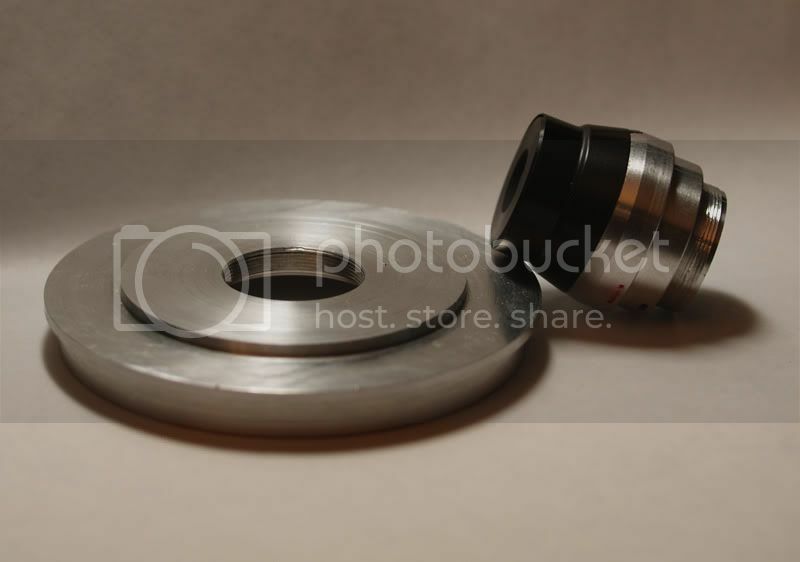 Also seen in the pictures is a regular M39->Nikon F-mount adapter (silver colored). With some layers of tape on the barrel the JML lens fits snugly in the mount. This way it's recessed approximately 1cm but sticks out enough to be able to mount a diffuser (I use a white plastic yoghurt bottle). Inserting the JML all the way against the bottom of the mount (with a RMS-threaded hole) helps avoiding unwanted tilt effects. 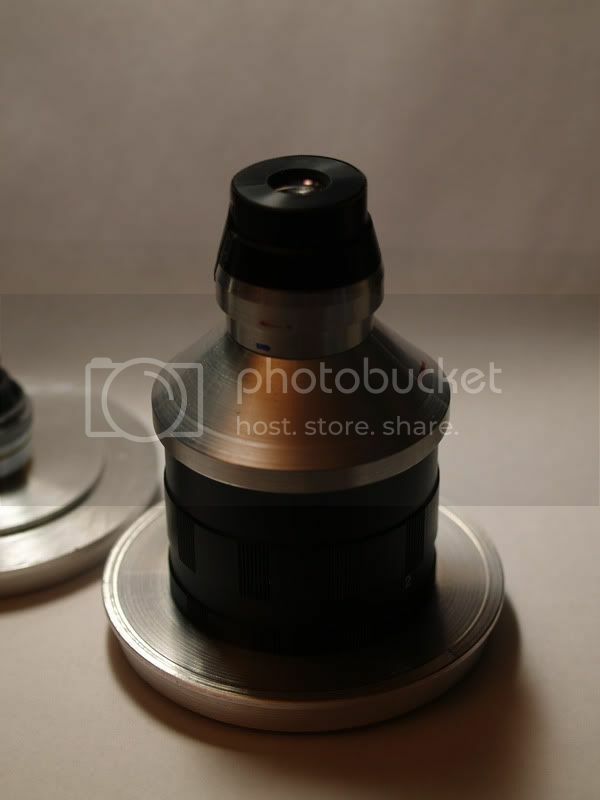 My solution was epoxying the rear part of the barrel of an RMS microscope objective inside the barrel of the JML lens. You can see a detail in the top right portion of the picture, and the modified JML lens among colleagues. One thing to remember in this type of modification is that the two parts should be well centered within each other, and their axes parallel. A relatively tight mechanical fit ensures centering, while alignment can be achieved with a temporary jig while the epoxy sets. 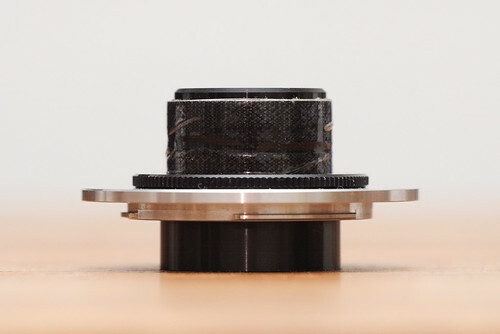 The easiest way, in this case, was to screw the RMS attachment into a flat RMS adapter and push-fit the JML lens on top of it until the rear flange of the JML lens rested on the surface of the RMS adapter. 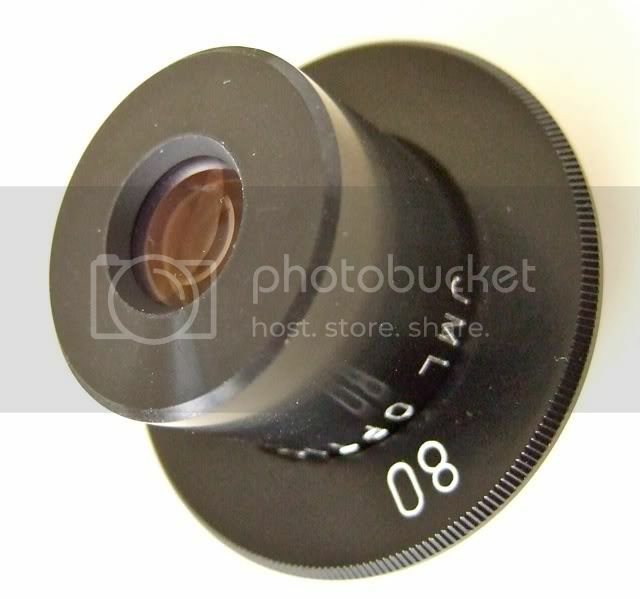 A possible concern with this modification is that the RMS attachment somewhat constricts the field of view of the lens. 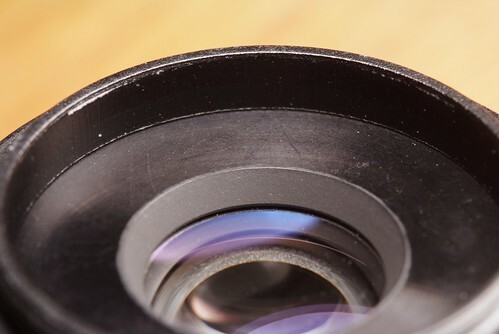 It is likely that this will cause vignetting at low magnification and with a large sensor size. In my case I do not worry because I have better lens alternatives for low-magnification work, but you might want to think about it if you wish to use this lens at low magnification. One more thing to do is painting the interior of the new mount matte black. 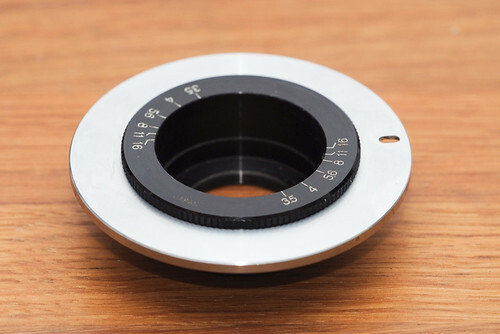 My solution is to use the adaptor ring from a Leitz 8cm Summar bellows lens. 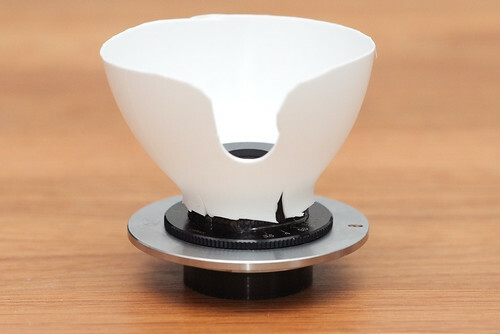 The JML lens only required one layer of acetate tape around it to make it a firm friction fit. The adaptor ring then screws into a Leica 500935 Leica R adaptor and thence onto a Leica R extension tube and then onto the Leica bellows R.
Then using a Leica R to 4/3 adaptor, the Bellows R is attached to an Olympus E-1 DSLR. As this thread is just for set-up I'll not post the images here. Could we start a separate thread for images taken with the JML lens? 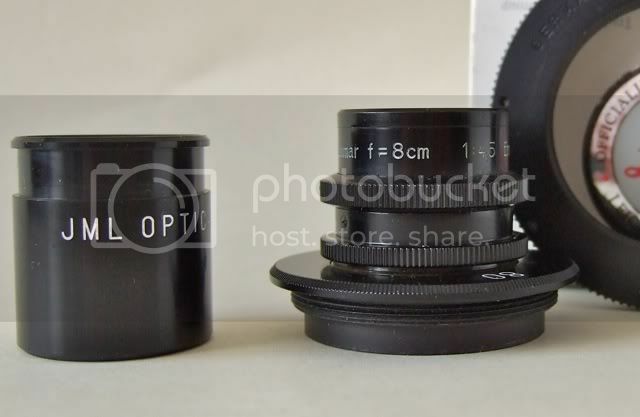 I have a JML Optical 36mm f3.5 lens with built in iris (up to f8 ) from a microreproduction system, 1" mounting threads - anyone seen that before? Of course, the problem is that they do not show the physical dimensions or mount, which is understandable considering the length of the list. 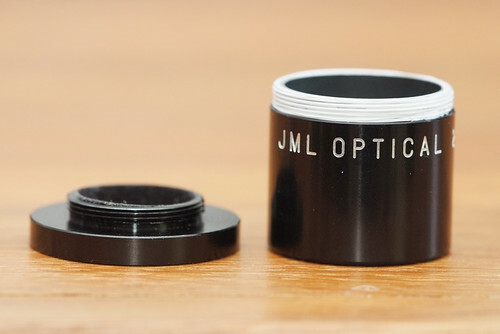 And unfortunately, none of the JML lenses I’ve seen have any type of part number or model number markings on them (some do have serial numbers). If your lens is marked, you might be able to find it in the list. 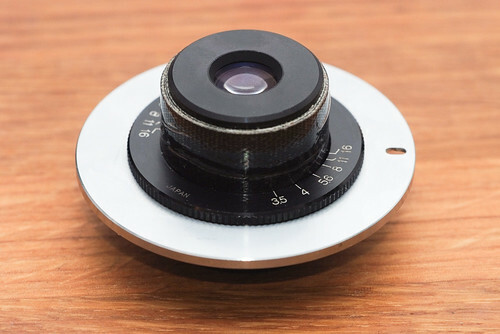 If not, the best option is to write an email to JML with images of the lens and dimensions. I did this with the JML 21mm f/3.5 and got a prompt response from the Director of Catalog Sales who identified the lens and sent some info that was not on their site. 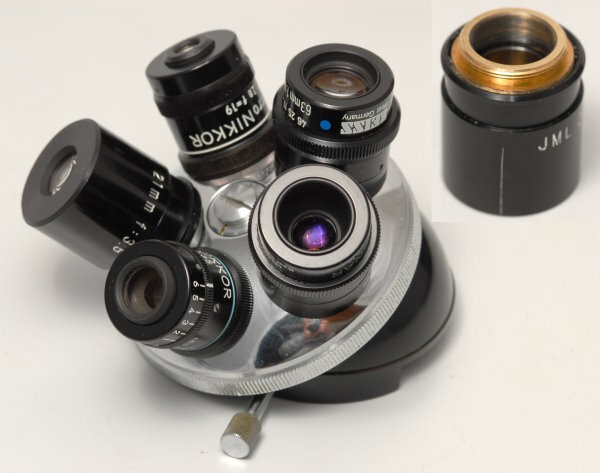 He also made it clear that they re-purpose many of their optical designs for different applications, in different mounts. 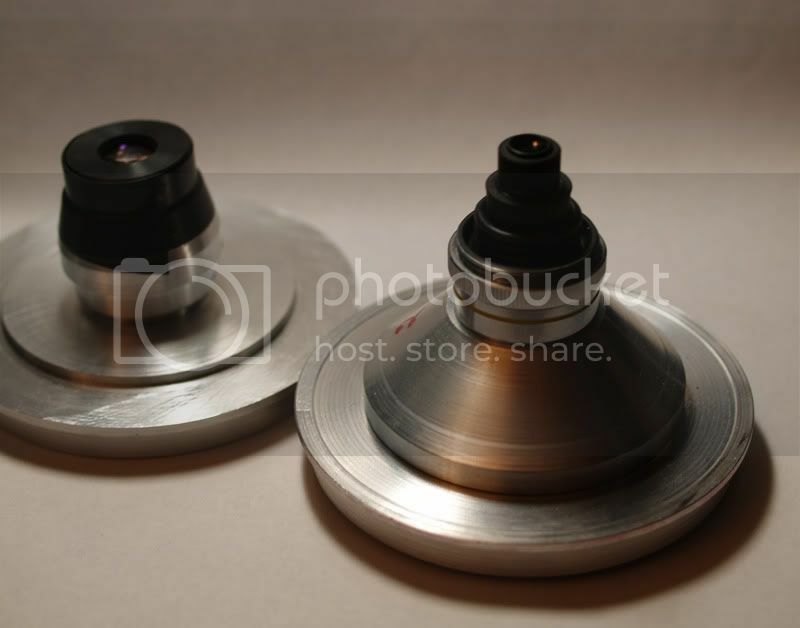 They also make many one-off custom designs for specific applications. Thanks Bob, I have already seen that link and I know their (not so great) site. 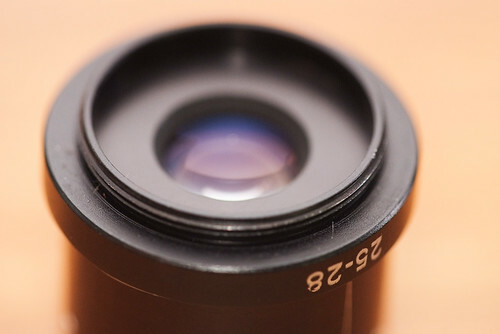 I guess what I have is that 8 element 35.5mm (rounded 36mm) lens, as it really delivers sharp images. Good idea to contact them, I will do that. Yes, it's clear that JML has the expertise to design and built excellent optics that can work well for macro photography. I haven’t had a chance to write back to the JML rep. to see if they might be interested in providing state-of-the-art lenses to the macro community. It's painfully obvious that Canon, Nikon et al are no longer interested in this market segment! I’ll try to write to JML this weekend and provide appropriate links to this forum. Thing is their bean counters are going to want to know the potential sales volume---I have no clue on this one! Yes, it's clear that JML has the expertise to design and built excellent optics that can work well for macro photography. Thing is their bean counters are going to want to know the potential sales volume---I have no clue on this one! Me either. 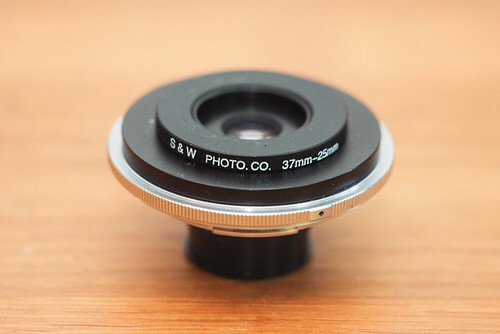 It seems clear to me that enthusiasm for this particular lens is partly due to the low cost of the current batch. On the other hand, membership of photomacrography.net will soon top 1000, and a lot of people read without ever becoming members. I suspect the sales volume would depend a lot on how effectively the lens were marketed, but unfortunately marketing is another thing that I have little clue about. 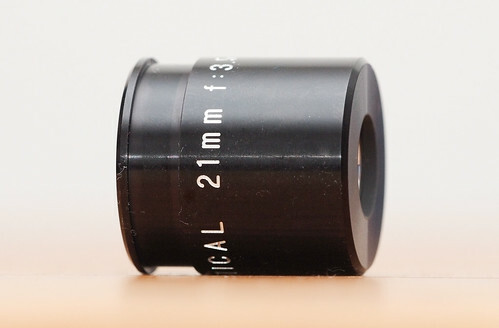 Just received a couple of these lenses and followed Enrico's approach with a rms adapter epoxied in place for one. The other I'm debating it's use. This may also be of interest. 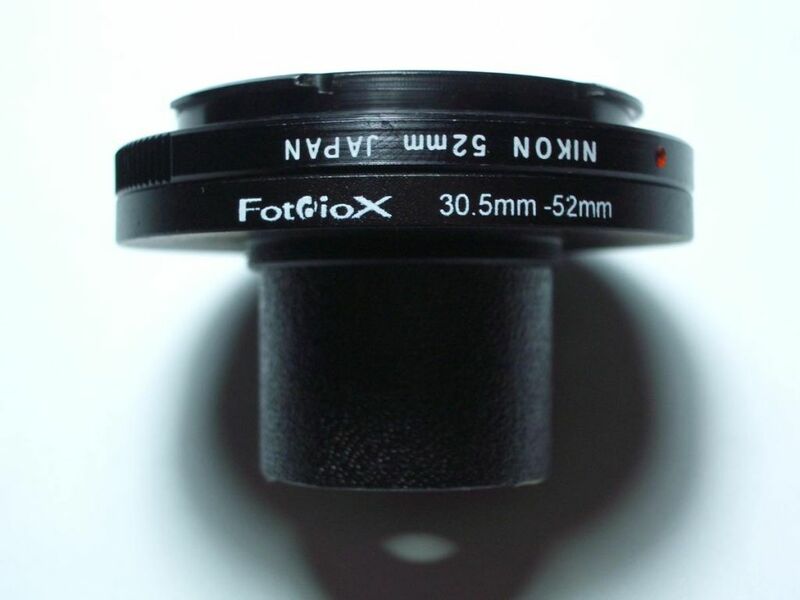 There is an indentation on the external barrel of the JML 21mm f3.5. Would it be possible to secure a threaded ring (or two halves of a threaded ring) to that part of the JML barrel? 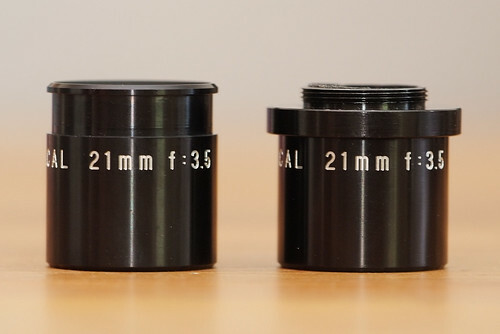 Has anyone measured the minimum magnification of the JML 21mm/f3.5 and the distance from the film plane at such magnification? With the adapter in place it's about the same height as the original lens. In order to be able to use this lens on a bellows setup at relatively low magnifications I wanted to recess it more into the bellows. A 25->28mm step-up ring + a couple of layers of the white thread tape make a tight and "self aligning" fit. 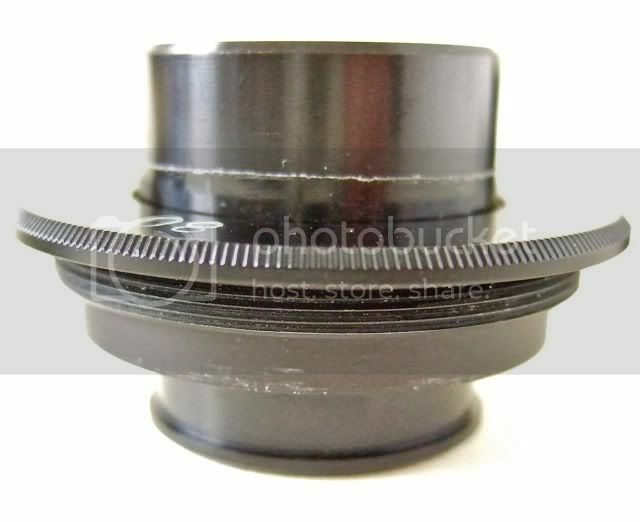 The 25mm male thread on the front of the JML lens screws in "from behind" in a female 25mm->F-mount adapter assembly (Nikon K2 ring + 52->37mm step down + 37mm->35mm step down). Looks a bit complicated perhaps but the principle is simple. This was the my first acquaintance with the thread tape and I'm very pleasantly surprised so I thought it deserved a special mention. Plumbers use it to seal threads. Not sure what its made from but it's extremely thin and flimsy (cellophane like) and without any adhesive. It applies easily and somehow sticks to itself. When you screw something on it the first time, it forms to fill out the gaps and it offers just the right friction to glide easily without coming loose. 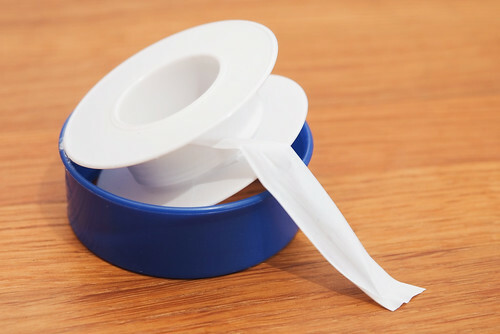 It seems quite durable – you're able to screw and unscrew the threads many times without damaging the tape. 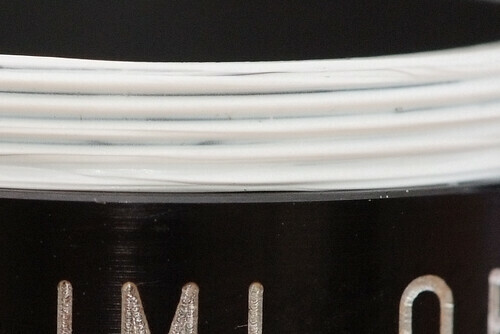 This is a close up showing the tape applied to the (unthreaded) JML lens after the adapter has been screwed on and off. It doesn't seem to get hard (easy to remove) but it's solid enough to let you pick it up by the "pseudo threads" without damaging them. Brilliant solution - thanks for sharing ... It is 'teflon' or PTFE tape ie polytetrafluoroethylene. I have other lenses which can probably be adapted using the tape.